In the fourth in a series of trials at Stratford Magistrates Court involving demonstrations against the DSEI arms fair in London last year, the judge has thrown out the charges, describing the protestors’ actions as ‘reasonable’. In a boost to the right to peaceful protest against the arms fair, District Judge Hamilton acquitted all four defendants of charges of obstructing the highway. Raj Chada, a criminal defence lawyer at London law firm Hodge Jones & Allen defended Nora Ziegler, one of the protestors in court this week. The remaining three represented themselves. All of the defendants had accepted that they had “locked on” in the middle of the road that leads to the Arms Fair. In a symbolic action, the group who were all committed Christians, indicated that they wanted to turn a road that was carrying weapons of destruction into a safe space for prayer for a short time. However, all were arrested after a matter of minutes by the police. More than 100 people were arrested in September 2017 outside the Excel Centre in east London, during the DSEI (Defence & Security Equipment International) arms fair, which takes place every two years. Likely the largest event in the world, the fair attracts international arms dealers from countries including Bahrain, Oman, Saudi Arabia, Pakistan and UAE. Charges against most of the protestors were dropped, but the remaining 46 activists have faced trial throughout January and February. Nine of 10 protestors tried in January were found guilty of obstructing the highway. Opponents to the arms fair have pointed out that exhibitors have previously been found to be promoting unlawful weapons, specifically in 2007 and 2011. These breaches were discovered by external bodies such as Amnesty International and other NGOs. Since 2015, DSEI has banned such organisations from the fair. 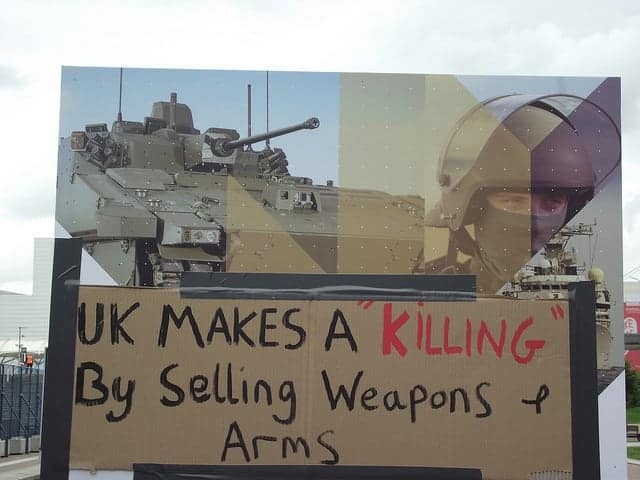 Opponents also point out that some of the world’s most repressive regimes buy weapons at DSEI. Saudi Arabia, for example, is accused of committing breaches of international humanitarian law and crimes against humanity in Yemen, with the aid of weapons purchased from UK companies. Arms sales to Saudi Arabia have increased by nearly 500 per cent since the start of the war in Yemen, with more than £4.6bn worth of arms sold within the first two years of bombings.